In July’s half year results Hammerson announced a change in strategy to shift focus more on their premium outlet and shopping centre schemes. To allow for this focus, they are expected to dispose of their retail park portfolio, selling off their 14 retail parks, the largest being the Central Retail Park in Falkirk and the smallest the Brent South Shopping Park in North London. With this news, I am going to use LDC data to understand the portfolio’s strengths and weaknesses as well as any potential opportunities for prospective buyers. My analysis will look at the occupancy rates across the portfolio, the LDC Health Index rating and the occupier covenants based on their historical openings and closures and the performance of their respective categories. 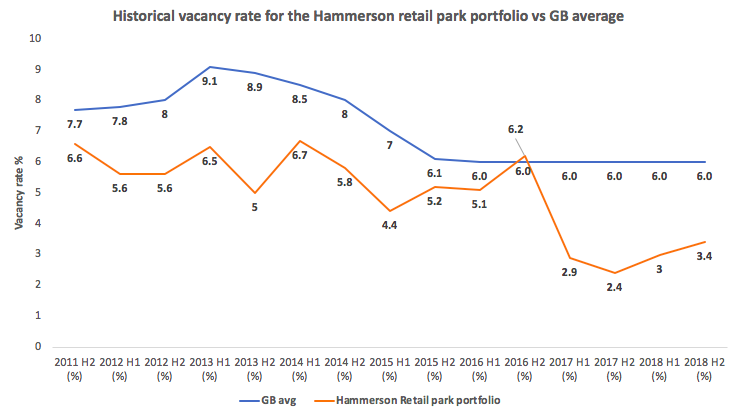 The vacancy rate for the Hammerson retail park portfolio has been consistently below the GB retail park average since H2 2011, with the rate rising above the GB average only once in H2 2016. This shows that these assets have been managed well, with new occupiers found quickly for vacant space and leasing activity that has ensured that the majority of their occupiers are retained. As of July this year, the vacancy rate sits at 3.4% compared to the GB average of 6.0%. 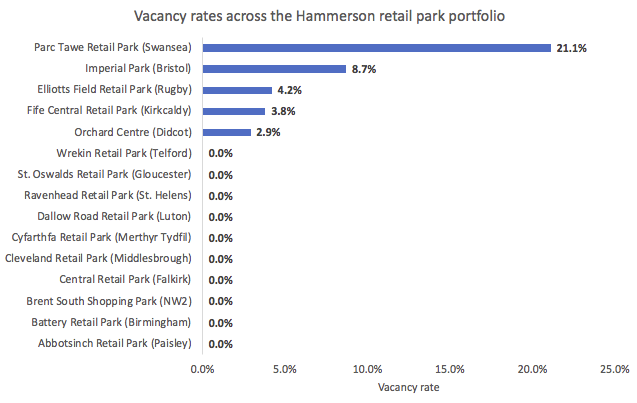 Of Hammerson’s portfolio, Parc Tawe retail park in Swansea has the highest vacancy rate at 21.1% (four vacant units, with a combined floorspace of 36,630 sq.ft.). However, nine of the fourteen retail parks are fully let (0% vacancy rate) with this equating to 97.2% of the total floorspace across the portfolio as shown in Figure 4 (Source: Completely retail). 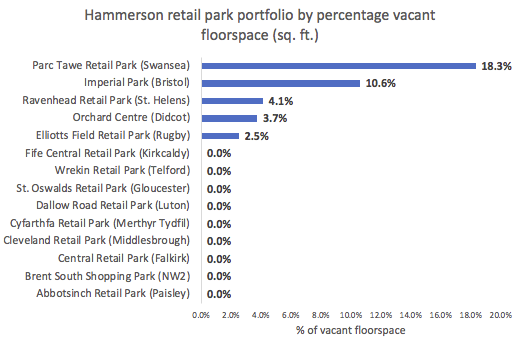 Figure 4: Hammerson retail park portfolio by total vacant floorspace (sq. ft.) against total. (Source: LDC/Completely retail) (N.B Units under offer are classed as vacant). 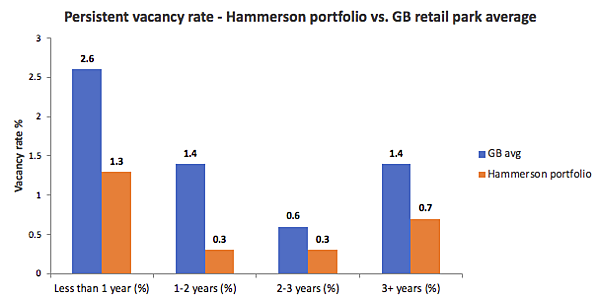 The Hammerson retail park portfolio has low levels of persistent vacancy which are consistently below the GB average across all thresholds. Persistent vacancy is rare in retail parks with the majority of vacant space across all GB retail parks being vacant for less than one year. However, the recent flurry of administrations in this space will add to the natural level of churn in the sector (e.g. Maplin, Poundworld, Toys R Us etc.). 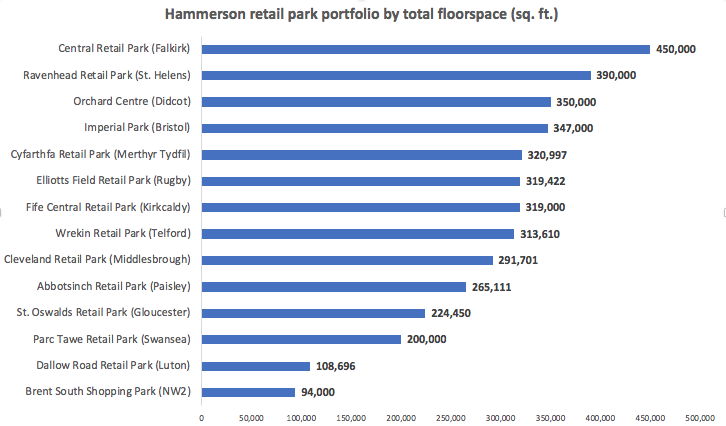 The Hammerson portfolio performs well on this measure, which shows there is strong tenant demand for their space across their retail parks due to their attractiveness to the local population and strong tenant line-up. How attractive are these parks? Hammerson retail park portfolio attractiveness can be understood by applying LDC’s Health Index methodology, which looks at the strength of the catchment population, the affluence of the catchment, the quality of retail mix and the demand for units across parks based on vacancy rates amongst other metrics. The majority of these retail parks have an LDC Health Index rating between 5 and 7 out of 10, which shows a stable asset with medium strength. The weakest retail park according to the LDC Health Index is Parc Tawe retail park in Swansea which has a 3 out of 10 rating. This park scores poorly due to a high vacancy rate of 21.1% (significantly above the GB average), units that have been vacant for over 12 months, and its lack of a strong food and beverage offer to match its entertainment facilities (Odeon Cinema and Tenpin Bowling) that would increase dwell times. 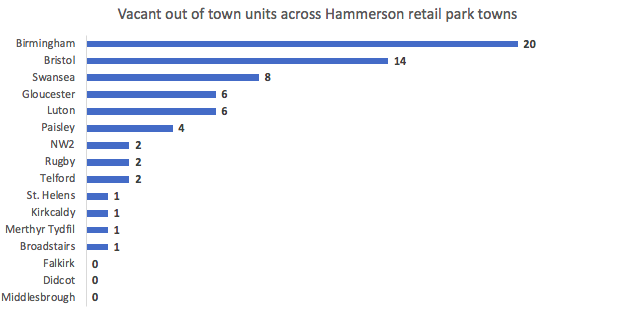 Figure 6: Percentage of Hammerson retail parks by LDC Health Index rating as of July 18 (1= weak, 10= strong) (Source: LDC. Hammerson retail park occupiers – who are they? 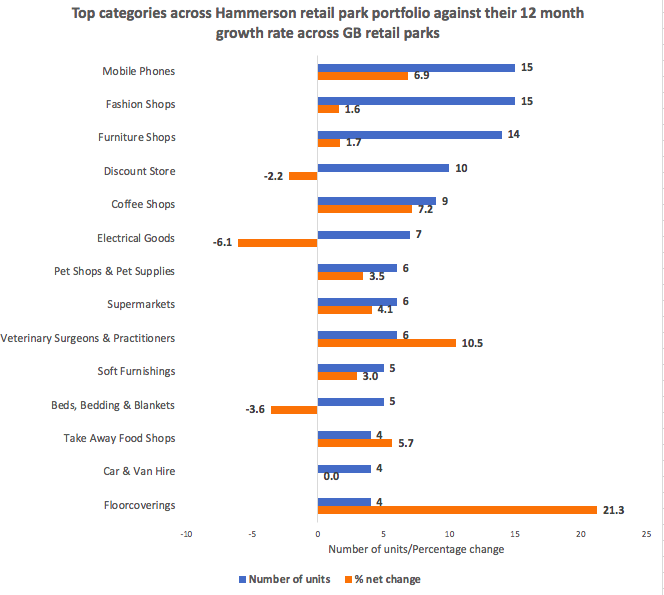 Figure 7: Top categories across the Hammerson retail park portfolio against the 12-month growth rate across GB retail parks. (Source: LDC). The top occupiers by retail sub-category are mobile phone and fashion shops who both have 15 units with various brands across the portfolio. Among the top five, the only category which has seen a decrease in GB retail park units over the last 12 months is discount stores. This has been driven by the closure of Poundworld, Bargain Buys, Poundstretcher and Poundland stores. 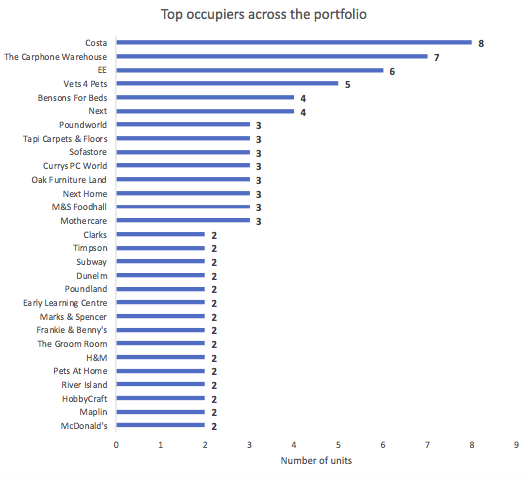 Generally, the Hammerson portfolio has a stable occupier market, with only three categories with a significant amount of space (more than four units) across the portfolio seeing a general decline (discount stores, electrical goods and beds, bedding & blankets). When the analysis is extended to categories with three units, all four of these have seen a decrease in the last 12 months (toy shops, clothes -women, nursery goods & accessories and department stores. Costa (8), The Carphone Warehouse (6) and EE (6) have seen the largest number of openings across the portfolio in the last five years. Homebase (3), Carpetright (3) and Curry’s (3) have closed the most units across the estate in the last five years. The portfolio has experienced some fallout from recent news of administrations and CVAs, with Carpetright closing three stores, Brantano Footwear three stores, Poundworld three stores, and Toys R Us and Phones 4u two stores respectively. The merger of Curry’s and PC World stores into one store also had an impact on the retail park portfolio, similar to other retail park owners across GB. Central Retail Park in Falkirk is the most dominant asset in its catchment with 100% of the total ‘out-of-town’ units (stores not within the main shopping area of a town) still within the postal boundary for Falkirk. This makes this asset highly attractive and the main out-of-town shopping location for the catchment. Bristol (Imperial Park) and Luton (Dallow Road Retail Park) have the lowest share of out-of-town units, as each of these locations has a large out-of-town retail presence to compete against. In Bristol, Imperial Park has to compete with 17 other out-of-town retail parks of varying size (excluding Cribbs Causeway), while in Luton, Dallow Road Retail Park competes with larger retail parks (Luton Retail Park and Hatters Way Retail Park) as well as being in close proximity to Milton Keynes. 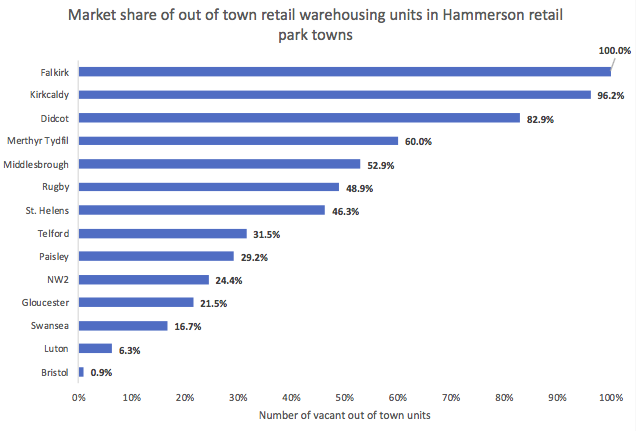 Figure 9: Total market share of out-of -own retail park units in towns with a Hammerson retail park. (Source: LDC). Bristol has the most vacant out-of-town space, with the city having a large competing scheme in the centre of the city (Cabot Circus) and a thriving high street, the out-of-town locations experience low demand of their units. This count excludes The Mall At Cribbs Causeway, but still includes over 200 units, resulting in an oversupply in out-of-town retail stock in the area. This will be a challenge for the new owner of this park, with competing schemes fighting to attract existing occupiers when leases come up for renewal. A similar situation may occur in Swansea, Luton and Gloucester with over six vacant units across these towns. Investing in retail parks carries risk, with tenants unwilling to sign up to long term leases (no longer than 10 years) contrary to the fabric of retail warehousing which is accustomed to leases being between 10 and 25 years in the past. This is likely to put increased pressure on rental income in the sector, except for well-let, well-located schemes. The Hammerson retail park portfolio offers great opportunity for any potential investors in the sector, with the majority of the retail parks fully let and 50% of the assets controlling at least 45% of the total out of town space in their respective towns. The main challenge will be maintaining their existing occupiers, with the pipeline for potential occupiers narrowing with the consolidation of retail space in key out of town categories such as discount stores, electrical goods and fashion retailing. For more information on how LDC data can support investment decisions such as these, get in touch via email at sales@localdatacompany.com or call us on 0203 111 4393.